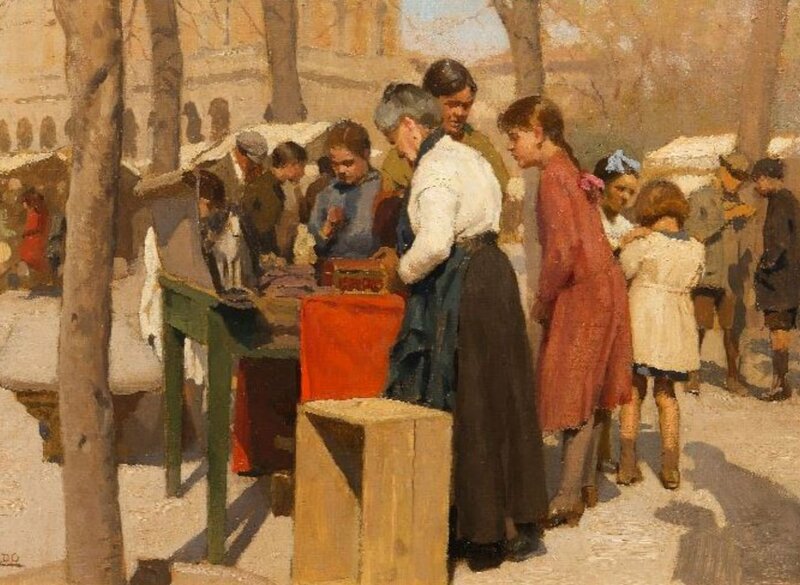 Although the Italian peasants on the market stall are in the forefront of this painting, they are not the focus. The work is seen as a whole; the figures are part of a landscape which describes rural life in Italy. This is painted in the Realist style, which was catalysed by Gustave Courbet in the 1870s, and became popular in France and Italy. Alberto Zardo, along with the other Realist artists, wanted to remove himself from the romanticism of the previous Victorian tradition, which had idealised rural and working class life to a saccharine degree. Zardo continued alongside Courbet and his followers who aimed to highlight the realities of ordinary peoples’ lives. 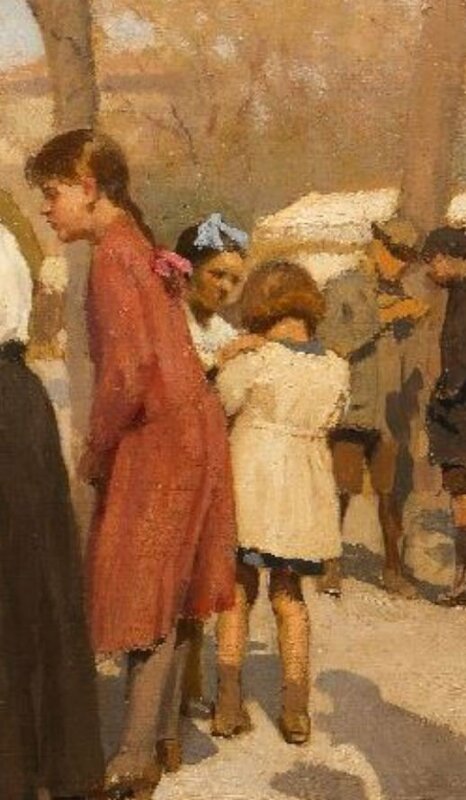 Alberto Zardo was a Realist Italian artist. He attended the Academy of Fine Arts in Florence and made his debut at the Florentine Painter’s Exhibition in 1896. He devoted himself to domestic themes, in conjunction with the coeval poetics of G. Pascoli for example, La convalescente, which was exhibited in Milan in 1898, and symbolic landscapes; Afternoon, Winter Night, Idyll, exhibited in Florence in 1905. From the beginning of the Twentieth Century, he worked as an illustrator and in 1901 won the first prize in the Alinari competition for the Divine Comedy. He later dedicated himself to devotional themes, depicting biblical imagery with the subjects wearing contemporary Italian peasant clothing.